Just State Flags Washington State Flags are in stock in all sizes. Save up to 15% on 2-flag Sets each with American and Washington Flags bundled in a a variety of size combinations to save you money. Washington Presentation Sets are for indoor display, as well as outdoor parades and ceremonies. From 7' to 9' Heights. 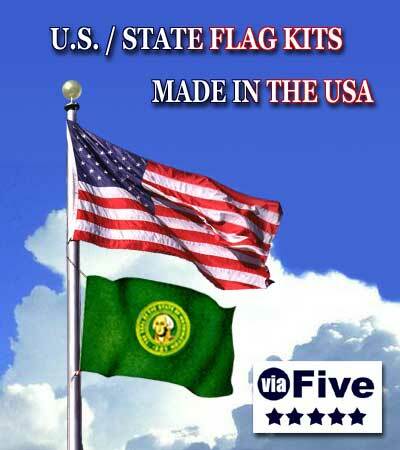 Washington Flag Pole Sets feature Five Star Flags exclusive Stainless Steel single piece pole kits. Washington State Flag History Homework and Legal Help can be found at the Flags of the World Site. Click here if you need help in Washington to retire your American flag. These premium US Flag and Washington State Flag Sets feature top-of-the-line US-made flags for durable flag flying.